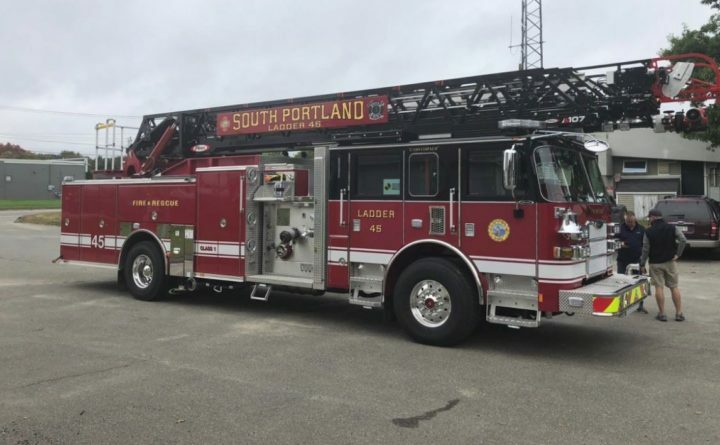 Three South Portland firefighters were training with a new $1.1 million ladder truck Tuesday morning when they accidentally hit a power line with the truck’s aerial, according to a statement released by City Manager Scott Morrelli Tuesday night. The contact with the electrical line caused a fire to the truck’s front right tire and shorted the controls of the aerial, keeping the firefighters from moving the extendable ladder away from the line, Morrelli said. As a result, Central Maine Power Co. cut power to Skillin Street, running alongside the Cash Corner fire station where the training was taking place, he said. The firefighters were ultimately able to put out the fire and move the truck. The city is preparing to work with engineers to determine the extent of the damage to the truck and what it will cost to repair it. Firefighters will resume use of an older 1996 ladder truck in the meantime, Morrelli said. None of the firefighters were injured, he said. “The city is conducting an internal investigation as to how this incident happened, what steps need to be taken to prevent it from happening again, and any other actions that may need to be taken due to the seriousness of this event,” the city manager said.